Yoga has been found to benefit all the components of health viz. physical, mental, social and spiritual well being by incorporating wide variety of practices. Yoga techniques include the practice of prāṇāyāma, which regulates respiration through variety of exercises, and āsana, which includes various physical exercises and postures in a highly coordinated manner integrated with systematic breathing. Although yoga is a discipline which is not just confined to āsana (postural exercises) or prāṇāyāma (breathing exercises), but most studies are based on exercise effect of yoga. This is so because āsana and prāṇāyāma can easily be taught and learned and thus incorporated in to life style. These exercises have been found to bring about positive biochemical and hormonal changes by eliminating stress and instilling a sense of discipline. Yoga is also easily accepted by the elderly because yogic exercises consist of slow, rhythmic movements which bring about adequate stretching of muscles and joints with appropriate strengthening in these structures as well as it stimulates glands such as pancreas to augment insulin secretion. Abnormal increase in sympathetic activity and reduction in parasympathetic activity has been associated with Type II DM. Chronic stress; anxiety and depression have already been implicated in pathogenesis as well as the aftermath of diabetes. Some studies have shown positive effects of yoga intervention on stress and anxiety. Studies and reviews have clearly shown the positive effects of Yoga on glycemic control, blood pressure, lipid profile, stress, anxiety, and depression but have not identified the mechanisms of action of Yoga in Type II DM. Previous studies have clearly stated the need to review mechanisms by which yoga helps in diabetes. This study reviews published literature to explain psycho-neuro-endocrine and immune mechanisms of action of Yoga in improving Type II DM. Independent search was conducted by two researchers independently using search terms 'Yoga OR Pranayama AND diabetes OR diabetic IN title or abstract in National Library of Medicine- MEDLINE (www.pubmed.com) website. The retrieved citations and articles were appraised and mutual consensus was obtained in presence of the two more researchers. The included articles were then grouped qualitatively under effect of yoga explaining psychological, neural, endocrine and immune mechanisms of action. Published literature concerning mechanisms of action of Yoga in Type II DM emphasizing psycho-neuro-endocrine or immunologic relations was retrieved from Pubmed and Pubmed Central and analyzed. Those studies which explained the psycho-neuro-endocrine and immune mechanisms of action of yoga were included and rest were excluded. Although primary aim of this study is to explain these mechanisms in Type II DM, studies in non-diabetic population which had a similar pathway of stress mechanism was included because they had parallel explanations in line with objective of our study. Aim of this study is not to quantify the benefits rather it was aimed to explain mechanisms of action (MOA) of yoga in Type II DM. therefore, studies which have not explained MOA of yoga were excluded. Further, there seems to be a common pathway of stress mechanisms and immune reactions especially concerning Hypothalamic- Pituitary- Adrenal (HPA) Axis, therefore some studies of non-diabetic population have been included to explain immunologic benefits of yoga extrapolating from cancer studies to postulate possible benefits in diabetic subjects. Key words used were psychologic, neurologic, endocrine, immune, mechanisms of action, Yoga and Type II Diabetes Mellitus. Total of 89 studies were retrieved by various combinations of key words, which was subjected to an expert panel of 4 faculties to include and exclude studies. Of the 89 articles, we excluded non-English articles (22), editorials (20) and letters to editor (10). 37 studies were taken in to account for this review. Studies on Yoga provide convincing evidence for its effectiveness over autonomic nervous system. Bagchi and Wenger reported that yogic meditation induces inner relaxation of ANS without inducing sleep as well as raising immune levels in the body without exaggerating physiological manifestation against external stimuli, thereby providing a balance between body and outside world. Kulkarni and Bera, 2009 reported HIP as a method of neuropsychology to understand role of cortex and stimulus information processing. HIP has been theorized to constitute five steps, namely, detection of stimulus, discrimination, decision, memory and reaction time. These steps succinctly explain processing of cognitive stimuli with meaningful motor output. Its conjugation with stress can be understood as stress being the result of withdrawal of attention and reduced attention sensitivity thereby detrimental towards health. Since the limbic system is the seat of emotion, any stressful event diverts cortical aspects of attention process to affective response. This in turn negatively affects the HPA axis. Ultimately the immune system is also negatively affected. This pathophysiological phenomenon is represented in a schematic diagram [Figure 1]. Yoga acts via downregulating the HPA axis which gets hyperactivated as a response to abnormal physical or psychological demand (stressor). Any stressful situation affects balance between sympathetic and parasympathetic systems by release of increased cortisol and catecholamines. This response is classic 'fight or flight' response which is encountered by hypermobilization of energy needed to combat the stressor. This constant state of hyper vigilance resulting from repeated firing of HPA axis leads to dysregulation of normal body system leading to stress-related diseases such as diabetes, depression, obesity and cardio vascular diseases. Yoga attenuates the stress cascade by reducing the perception of stress. Yoga decreases physiological manifestations of stress by reducing heart rate, blood pressure and respiratory rate., A study by Smith et al. showed increased pain tolerance and lowered pain related brain activity during MRI in yoga practioners. Tooley et al. found significantly higher plasma melatonin levels in yoga meditators. Harinath et al. found increased melatonin, improved psychological and cardio respiratory profiles in yoga practioners after 3 months of practice. Reduction of cardiovascular risk factors in diabetes is a hallmark of successful diabetes management.,, Yoga seems to be beneficial in doing this. Mechanism of action of Yoga can be hypothesized under two pathways:Firstly by way of vagal stimulation and secondly by parasympathetic activation and HPA axis modification. Thefirst postulated mechanism is through Yoga's action on vagal stimulation by improving baroreflex sensitivity, reducing inflammatory cytokines, and thereby reducing blood pressure and resting heart rate.,,,, Yoga practice also improves endothelial function and reduces risks of cardiovascular diseases in Type II DM. Second postulated mechanism of action of yoga is through parasympathetic activation and associated anti stress mechanisms. It reduces perceived stress and HPA axis activation, thereby improving overall metabolic and psychological profiles, increasing insulin sensitivity, and improving glucose tolerance and lipid metabolism. These pathways are shown in [Figure 2]. Stress is a root cause of many diseases. 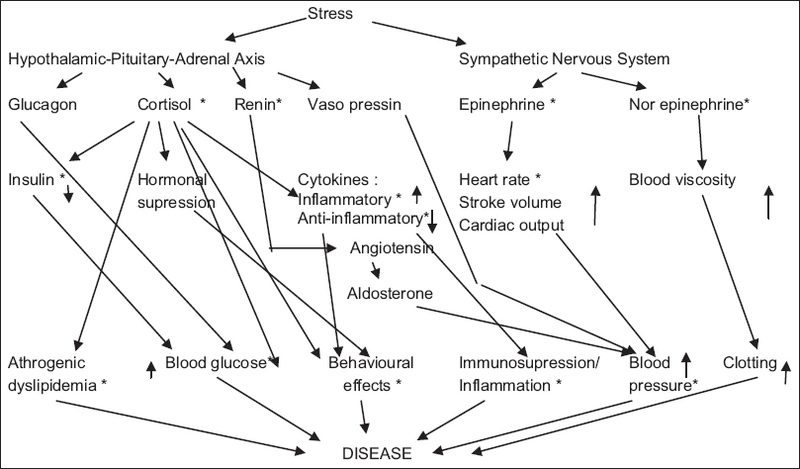 [Figure 3] portrays the pathophysiological cascade of stress and disease. 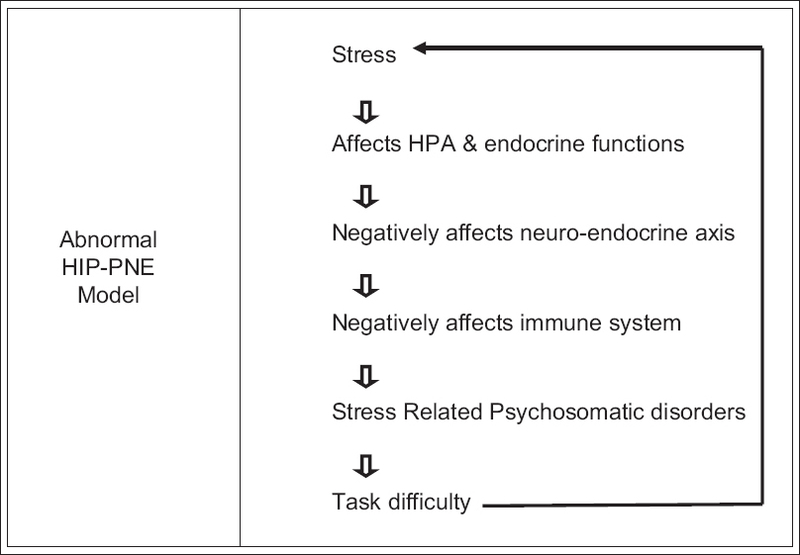 Through constant deregulation of HPA axis and the sympathetic nervous system, stress keeps the entire mechanism in chaos with dysregulation of hormones such as cortisol, catecholamines etc. Their increased stimulation over a period causes diseases such as Type II diabetes. Yoga acts in an opposite manner by bringing balance to both the autonomic nervous system and the HPA axis. It reduces secretions of cortisol, catecholamines, inflammatory cytokines, rennin and anti-inflammatory factors. A previous study has revealed preponderance of alpha waves in yogis recorded through EEG. Physiology of neural plasticity is a significant discovery which has provided the basis for understanding rehabilitation science and the regaining of lost functions after neurologic insult. The ability of neural structures to repair their functions, reorganize structures through flexibility in neural structure, is known as neural plasticity. It mainly comprises of developmental, experience related and regeneration related components. Yoga asanas and yogic practices involve both motor movements and sensory experiences. Thus, it may be hypothesized that yogic practices utilize neural plasticity to bring about sustained changes in structure and function of the brain. Although neural connections and structures are more dependent on genetics and development, experience related neural plasticity seem to play a greater role in reshaping neural structures. These theoretical considerations may explain how pathophysiology of Type II DM and regeneration of beta cells in pancreas may be positively affected by Yoga. Yoga practice is directly related to improved insulin sensitivity to glucose signals in Type II DM. It attenuates the negative relationship between factors causing insulin resistance such as obesity, increased waist circumference, dyslipidemia etc. Yoga also improves sensitivity of beta cells of pancreas to glucose signals. Manjunatha et al. have stated that there is reduction in brisk release of insulin when glucose level tends to fall whereas there is increased insulin release when glucose tends to rise in blood. This mechanism gets support from a previous study of Sahay who observed a fall in fasting insulin level when glucose level is at minimum level. Yoga optimizes insulin secretion as per bodily requirement through its neuro-endocrinal effects and thereby bringing about normalcy in the Insulin/Glucose ratio which is suggestive of better peripheral utilization of Insulin and reduced insulin resistance. No well designed experimental study has been reported concerning the effects of yoga on diabetics' immune systems. However, studies have reported the efficacy of yoga in different populations, especially cancer patients. Findings of these studies can be extrapolated to diabetes and immunology because some of the pathways of its mechanism of action are similar. A study by Ronson reported allostatic load as a cause of dysregulation of immune system in cancer patients due to dysfunction of the HPA axis as a result of the stress of oncologic pathophysiology. Although that study concerned cancer patients, dysregulation of HPA axis has been reported by many authors as cause of co-morbidities in Diabetics. In a study by SuQu et al., a yoga program had a rapid and significantly greater effect on gene expression in peripheral blood mononuclear cells (PBMCs) compared to the control group who were given only walking exercise with relaxing music. They suggested that gene expression alteration may be the basis for long term higher level health effects. Another study reported increase in cortisol level as a stress marker in examinees but this rise was less in the group of examinees who practiced yoga. Further, the yoga group showed attenuation of increase in cortisol due to examination stress which was attributed to relaxing effects of yoga on mind, in turn reducing stimulus to hypothalamus and anterior pituitary and thereby reducing secretion of cortisol. This study also reported mean plasma IL-4 rise and serum IFN-y decrease with examination stress. Decrease in serum IFN-y was significant in control group and non-significant in yoga group. Decrease in serum IFN-y is a marker of reduced cellular immunity. This study found yoga to exert a buffering effect on cellular immunity. It was conducted on a group of students with perceived examination-stress. However pathways of stress have been same as in diabetics and therefore, the finding is relevant to be discussed here. 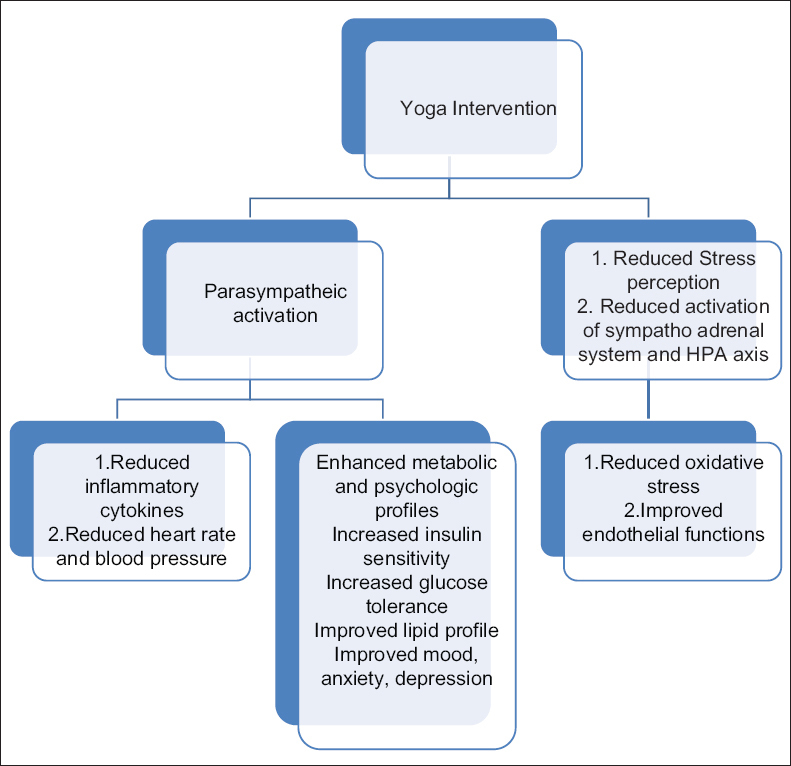 This study has examined mechanisms for the action of yoga in Type II Diabetes, especially the integrative mechanisms of psycho-neuro-endocrine and immune relationships. These are interrelated and complex to be understood and therefore there is no definite verdict on these mechanisms. Many experimental studies which have reported these probable mechanisms were limited by several issues such as unclear methodology, interventions and program structure, quasi experimental, lack of control group, confounding variables and smaller sample sizes. Some studies have even presented few data or too many confounders which make them difficult to generalize. However, we have tried to discuss the mechanisms of action of yoga in terms of psycho-neuro-endocrine and immune mechanisms in Type II diabetes with scope for future research. We recommend well designed blinded randomized studies to evaluate effect of yoga on immune markers in diabetics to obtain valid results. We also recommend experimental studies which can evaluate effect of yoga on psycho-neuro-endocrine mechanisms to prove the theories laid down by various studies discussed here. It is difficult to identify any single pathophysiologic mechanism of action of yoga in Type II DM as the risk factors and etiologies of Type II DM are multifactorial. Similarly it is difficult to postulate any single unidirectional pathway of Yoga action in Type II DM. Yoga's mechanisms of action in Type II DM are integrated and their effect is multisystemic. The psycho-neuro-endocrine and immune mechanisms of action of yoga in Type II DM represent a possible approach to understanding its holistic effects on disease modulation of Type II DM. This review suggests psycho-neuro-endocrine and immune mechanisms that may be important to understanding yoga's actions on Type II DM. Summing up, the words Samatvam yoga ucyate (2:48; Bhagvad Gita): Equanimity is yoga. Samatvam is being able to maintain one's balance of mind in success and failure, gain and loss, pleasure and pain, and that is the aptitude of a perfect Yoga master who remains equipoised in all circumstances. Samatvam of the mind can contribute in preventing many illnesses. Yoga of equanimity has the potential to control negativity of brain and behavior by modulating its activity through psycho-neuro-endocrine and immune mechanisms to restore and maintain health in the true sense. Dean, SMIMS, Gangtok and ICMR. Indian Council of Medical Research, ICMR. Alexander GK, Innes KE, Brown CJ, Kulbok P, Bourguignon C, Bovbjerg VE, et al. "I could move mountains": Adults with or at risk for type 2 diabetes reflect on their experiences with yoga practice. Diabetes Educ 2010;36:965-75. Gupta N, Khera S, Vempati RP, Sharma R, Bijlani RL. Effect of yoga based lifestyle intervention on state and trait anxiety. Indian J Physiol Pharmacol 2006;50:41-7. Sengupta P. Health impacts of yoga and pranayama: A state-of-the-art review. Int J Prev Med 2012;3:444-58. Marcy C, Mc Call. How might yoga work? An overview of potential underlying mechanisms. J Yoga Phys Ther 2013;3:1-6. Bagchi BK, Wenger MA. Electrophysiological correlates of some yogi exercises. Electroencephalogr Clin Neurophysiol 1957;7 Suppl: 132-49. Anderson JG, Taylor AG. The metabolic syndrome and mind-body therapies: A systematic review. J Nutr Metab 2011;2011:276419. Rao RM, Telles S, Nagendra HR, Nagarathna R, Gopinath K, Srinath S, et al. Effects of yoga on natural killer cell counts in early breast cancer patients undergoing conventional treatment. Comment to: Recreational music-making modulates natural killer cell activity, cytokines, and mood states in corporate employees Masatada Wachi, Masahiro Koyama, Masanori Utsuyama, Barry B. Bittman, Masanobu Kitagawa, Katsuiku Hirokawa Med Sci Monit, 2007;13:CR57-70. Med Sci Monit 2008;14:LE3-4. Saatcioglu F. Regulation of gene expression by yoga, meditation and related practices: A review of recent studies. Asian J Psychiatr 2013;6:74-7. Olivo EL. Protection throughout the life span: The psychoneuroimmunologic impact of Indo-Tibetan meditative and yogic practices. Ann N Y Acad Sci 2009;1172:163-71. Kulkarni DD, Bera TK. Yogic exercises and health – A psycho-neuro immunological approach. Indian J Physiol Pharmacol 2009;53:3-15. Qu S, Olafsrud SM, Meza-Zepeda LA, Saatcioglu F. Rapid gene expression changes in peripheral blood lymphocytes upon practice of a comprehensive yoga program. PLoS One 2013;8:e61910. Eyre HA, Baune BT. Assessing for unique immunomodulatory and neuroplastic profiles of physical activity subtypes: A focus on psychiatric disorders. Brain Behav Immun 2014;39:42-55. McEwen BS. Allostasis and allostatic load: Implications for neuropsychopharmacology. Neuropsychopharmacology 2000;22:108-24. Tooley GA, Armstrong SM, Norman TR, Sali A. Acute increases in night-time plasma melatonin levels following a period of meditation. Biol Psychol 2000;53:69-78. Harinath K, Malhotra AS, Pal K, Prasad R, Kumar R, Kain TC, et al. Effects of Hatha yoga and Omkar meditation on cardiorespiratory performance, psychologic profile, and melatonin secretion. J Altern Complement Med 2004;10:261-8. Selvamurthy W, Sridharan K, Ray US, Tiwary RS, Hegde KS, Radhakrishan U, et al. A new physiological approach to control essential hypertension. Indian J Physiol Pharmacol 1998;42:205-13. Ross A, Thomas S. The health benefits of yoga and exercise: A review of comparison studies. J Altern Complement Med 2010;16:3-12. Kiecolt-Glaser JK, Christian L, Preston H, Houts CR, Malarkey WB, Emery CF, et al. Stress, inflammation, and yoga practice. Psychosom Med 2010;72:113-21. Rajbhoj PH, Shete SU, Verma A, Bhogal RS. Effect of yoga module on pro-inflammatory and anti-inflammatory cytokines in industrial workers of lonavla: A randomized controlled trial. J Clin Diagn Res 2015;9:CC01-5. Schmidt T, Wijga A, Von Zur Mühlen A, Brabant G, Wagner TO. Changes in cardiovascular risk factors and hormones during a comprehensive residential three month kriya yoga training and vegetarian nutrition. Acta Physiol Scand Suppl 1997;640:158-62. Yadav RK, Magan D, Mehta N, Sharma R, Mahapatra SC. Efficacy of a short-term yoga-based lifestyle intervention in reducing stress and inflammation: Preliminary results. J Altern Complement Med 2012;18:662-7. McEwen BS, Stellar E. Stress and the individual. Mechanisms leading to disease. Arch Intern Med 1993;153:2093-101. Bijlani RL. Influence of yoga on brain and behaviour: Facts and speculations. Indian J Physiol Pharmacol 2004;48:1-5. Zope SA, Zope RA. Sudarshan kriya yoga: Breathing for health. Int J Yoga 2013;6:4-10. Manjunatha S, Vempati RP, Ghosh D, Bijlani RL. An investigation into the acute and long-term effects of selected yogic postures on fasting and postprandial glycemia and insulinemia in healthy young subjects. Indian J Physiol Pharmacol 2005;49:319-24. Russo-Marie F. Macrophages and the glucocorticoids. J Neuroimmunol 1992;40:281-6. Wu CY, Fargeas C, Nakajima T, Delespesse G. Glucocorticoids suppress the production of interleukin 4 by human lymphocytes. Eur J Immunol 1991;21:2645-7. Ronson A. Psychological stress in oncology: The role of glucocorticoids. Bull Cancer 2006;93:699-708. Bhasin MK, Dusek JA, Chang BH, Joseph MG, Denninger JW, Fricchione GL, et al. Relaxation response induces temporal transcriptome changes in energy metabolism, insulin secretion and inflammatory pathways. PLoS One 2013;8:e62817. Gopal A, Mondal S, Gandhi A, Arora S, Bhattacharjee J. Effect of integrated yoga practices on immune responses in examination stress – A preliminary study. Int J Yoga 2011;4:26-32.